Stella lights up the room, as per usual. So, as I come down from a mulled-wine-induced sugar high, I just wanted to post a quick update. We are over-the-top “in the spirit” of the holidays this year. Christmas was always such a magical time for me, and I am very excited about creating some good ol’ wonder for Stella Bella. Our halls are almost completely decked–and I even put a small pink decorative tree in the bathroom. Because I want to make sure we are jolly at absolutely all times. I’m making a holiday banner that looks like it’s on crack–it’s insanely busy with like ten different patterned papers and barely legible because there’s so much going on but, damn it, that thing is going to hang on our mantle as a testament to our enthusiasm for the season. No tube! This year’s holiday food issue seems to be how to cut Stella off from the cookies without prompting a melt-down. No waking up every 2.5 hours to tube-feed. However, Stella did wake up at 4:30 a.m. and would not go back to sleep. When this happens, Cody and I take it almost a little too well. Because it’s an incredible night’s sleep when you compare it to last year. No more being trapped at home. We’ll be traveling a bit this year, and for the most part, we are really, really looking forward to it. No more easy holiday photo card shoots. A better camera and some toddler cement boots would help. Oh and that banner? It will simply read, “PEACE.” Sums it up nicely, I think. 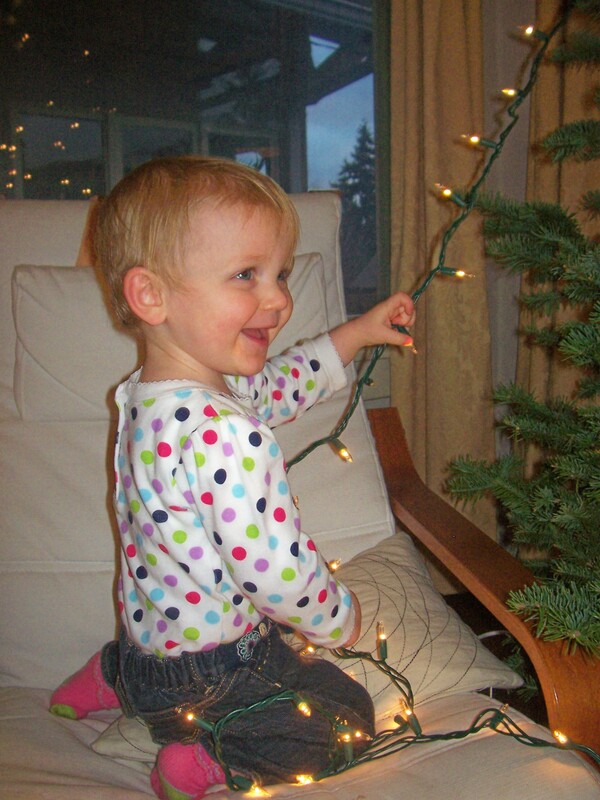 This entry was posted in Family update and tagged holiday, motherhood, toddler. Bookmark the permalink. 2 Responses to Tree’s up! Oooooooo!!! I’m so happy for you three. Just look at how much gratitude there is in this post. Hope you have a lovely holiday season… I for one am really grateful for YOU… your participation on my blog has made more of an impact than you can possibly know. I just left a response to a recent comment you made, but I’ll repeat the sentiment here… sometimes I find myself wavering, questioning what I’m doing, and then I’ll read something you’ve left for me, and I laugh, and feel inspired and fired up all over again. Stella is so lucky to have you as a mom.